The Force was strong with Billie Lourd as she paid tribute to her mother at Dodger Stadium on Friday. The 25-year-old Scream Queens star threw out the ceremonial first pitch at the start of the Los Angeles Dodgers-San Francisco Giants game, which was also the former team's annual Star Wars Night, and wore her hair in double buns, a nod to her late mom Carrie Fisher's character Leia. Lourd, who has often paid tribute to her mother on social media, sported the same hairstyle while playing Kaydel Ko Connix alongside her mother in Star Wars: The Force Awakens and Star Wars: The Last Jedi, Fisher's last film before her 2016 death. At the Dodger game, Lourd also wore a Dodgers jersey bearing the name Connix and the number 3. 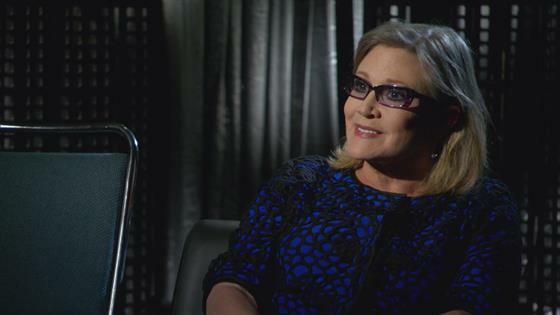 Carrie Fisher on Reprising Princess Leia Role for "Force Awakens"
Lourd posted photos from the baseball game on Instagram, writing, "I got to throw out the first pitch at the @dodgers Star Wars night and despite making some of the most bizarre yet deeply focused faces I've ever made in my life I had the most surreal incredible time and still have lil butterflies from walking onto that legendary field#rarenonhashtagpost #itsarunoncauseitsemotional #sorrygrammarteachersfrommypast #iconnix." The first 40,000 ticketed fans received a Dodger All-Star closer Kenley Jansen bobblehead, who is depicted as popular Star Wars character Lando Calrissian. A video of Lourd holding one of the figures was posted on the Dodgers' Twitter page. "Hey ya'll, it's Billie Lourd and I'm here for Kenley Bobblehead Night, aka Star Wars Night, and I've pretty much never been more excited. I'm weeping with joy," she said, letting out a scream.